Photons are not particles of light, but particular micro-incidents of sight. In my view light is a phenomenal quality of experience which is contagious in very specific and informative ways. One of those ways is ‘massive’ in its most immediate effects. Light is the affect and mass/energy is the effect. Part of multisense realism is a new interpretation of light. As I am not a physicist, there is no way to introduce this idea without sounding like a crackpot, but nevertheless I have not found any reason to suspect that this view is not plausible, and perhaps preferable to other interpretations that I have come across. To the contrary, the more time that goes by and the more experts who I talk to about it with, the more I am convinced that the obstacle to considering this view is in prejudice and misunderstanding rather than in any distortion of fact or lack of general understanding. The idea is that light (and all effects of energy) are inherent sensory-motor capacities associated with matter and distance rather than a separate product of matter. Instead of seeing energy as particles, waves, or disturbances in fields, we may be looking at a kind of fundamental perceptual communion of matter, which is local to matter and not to space-bound independent particles or waves. I think that the idea that photons are concrete entities is ultimately a misguided notion. Rather than literal particles or waves traveling through a vacuum, photons make more sense as a measure of micro-phenomenal stimulation (illumination), which propagates differently depending on what kind of instrument is being illuminated. Think of atoms like little emoticons, where individual particles or groups can wink or smile at each other, with the expectation of a smile or wink in return. The transaction is instantaneous within any frame of reference, but because frames of reference are nested by scale, there is latency when illumination is shared across disparate scales. The speed of light is not only constant and absolute, it is also instant. It is only the ratios of different sized frames of reference which redefine the scale of time. Planck units would only apply to Planck scales. Larger scales, such as biological scales, would have a different formulation of light, where cells are the relevant unit instead of atoms, and photosynthetic chemistry defines the character of illumination. To begin with, it is necessary to come to grips with the worldview which is implied by Einstein’s Special Relativity. In doing so, I think that it can be said that actually, There Is No ‘Speed of Light’. At least not in the way that most people would think of it, if they did ever think of it. There is a speed at which a state of illumination radiates from molecule to molecule or body to body which depends on physical qualities of the bodies in question, but I think that it is correct to say that light does not travel ‘through’ a vacuum at all, but figuratively jumps from within bodies through perception and imitative participation. It is the behavior of matter which waves and scatters, not independent projectiles or fields in space. Light, warmth, color, motion, are experiences, not objects. Albert Einstein postulated that the speed of light with respect to any inertial frame is independent of the motion of the light source, and explored the consequences of that postulate by deriving the special theory of relativity and showing that the parameter c had relevance outside of the context of light and electromagnetism. After centuries of increasingly precise measurements, in 1975 the speed of light was known to be 299,792,458 m/s with a measurement uncertainty of 4 parts per billion. In 1983, the metre was redefined in the International System of Units (SI) as the distance travelled by light in vacuum in 1 ⁄ 299,792,458 of a second. As a result, the numerical value of c in metres per second is now fixed exactly by the definition of the metre. The thing that makes light interesting to me is in the first sentence above: “the speed of light with respect to any inertial frame is independent of the motion of the light source”. This is that business of how velocities are roughly added among moving objects, but not with light. Light is always faster than any object, no matter how fast the object is moving. It is this property which leads me to suspect that light is not just the physical phenomenon which happens to be faster than all others, it is that light points to a maximum possible speed in terms of c defining the ontology of speed itself. 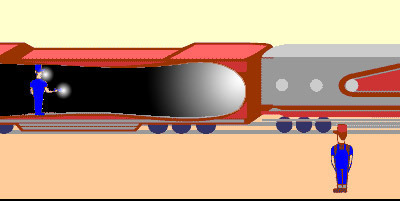 This is the tricky part because although my rendition of the entire beam appearing instantaneously is, I think, correct within this hypothetical setup of a human scale train, if this train were millions of times larger, then it could be argued that the beam would actually grow non-instantaneously compared to a human sized observer (i.e. miniscule). Rather than thinking of being able to see light moving, I think we have to anchor ourselves in the fixed Einsteinian constant of c, and understand that the latency which we observe (in a radio transmission between a distant spacecraft and the control center on Earth, for example), is not the result of waves of ‘energy’ traveling through space from antenna to antenna, but rather a reflection of the relative scales of the events involved. When we talk to the spacecraft we have to use a much larger ‘here-and-now’ compared to our own native human scaled time, so that the nesting of smaller and larger nows is reflected as scaled experiences of delay. This is just how matter makes sense of itself on different scales. It is not the speed of light, it is the speed of speed or the speed of sense, matter, or time. As our naive perception suggests, there is no concretely real ‘beam’ of light, rather there is a spot of light present at the target, as well as an illumination at the flashlight source, and in our eyes, and (not pictured) in our upscaled human mind. In other words, when we think of light as having a speed, we are not really understanding the full ramifications of special relativity and are merely projecting our Newtonian-Cartesian prejudices onto something which is not classical. The reason that it is not classical, however, I propose, is because visible light is not a projectile at all, but rather access to visual sensitivity, i.e. an extension of self-experience to incorporate the appearance of non-self in the visual range of perception (as opposed to tactile, aural, olfactory, emotional, or intellectual). Conventional assumptions about light infer a particle-wave-beam of ‘energy’ traveling literally through space independently. The multisense conjecture suggests participatory events which occur at each local material site. Each local perception embodies the local condition and perspective as a gestalt capitulation which includes traces of its relation with the other events. This gestalt capitulation (and I know this sounds like gobbledygook to most everyone but me) can be understood as an apocatastatic algebra (reconstitution, restitution,or restoration to the original or primordial condition) of elliptical simultaneity (elliptical in this sense meaning intuitive gesture which is unspecified yet adequately informative to the receiver; ellipsis ‘…’, ‘see what I mean?’) rather than linear process. It’s the opposite of a linear process – perception is the end point of all process the beginning point of all participation. Think of this more like feeling your fingers by touching them together. They are all part of your hand in one sense, on one level, but separate on another. Multisense realism proposes that the entire cosmos is like the hand, with each event growing like fingers, each of which are growing fingers, etc. What we experience as matter and bodies is where the fingers touch each other and feel that they are not identical. *gifs cannibalized from here and here. I doctored up this illustration to support my answer to how the double slit experiment works (Quora). The main point that I am trying to make (and I think it is, if true, a fundamental, history-of-the-world-changing scientific idea) is that if we suppose that our own sense of perception and participation in the universe has its ancestry in a primitive/primordial form* of sense, then the lowest levels of microcosm may look much different than we assume. 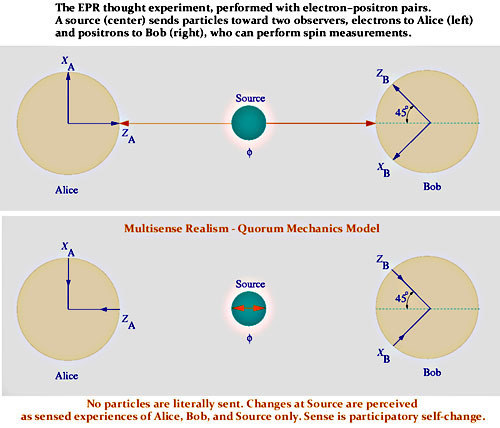 This model, which I am calling quorum mechanics or post-particle physics suggests that rather than a mechanical projection of particles from a source to observers, all QM interactions are a two way street. In the MSR model, photons are figurative rather than literal. The two atoms are presented not as literal particles in space but as vectors of sharable experience. The mode of signaling is not a literal waving of particles (as depicted in the gif) but a state of empathic/emotive stimulation. The intent here is not to provide a finished model of electrodynamics. The idea is to give more of a general direction of how hypotheses might be developed using particle-free, aesthetic-empathic signaling. The signal, or text is a shared quality of interiority which is generated by a masking and unmasking of context, which is the cosmological constant – an aesthetic-participatory ground symbolized here by the rainbow stripes. The black ovals symbolize a masking of the ground awareness which is localized. That masking should be understood to be a temporal, temporary localization…of locality. Spacetime is emergent from masking of the aesthetic ground. The masking can be understood to be entropy or insensitivity, the counter-aesthetic which makes it possible to confine and elaborate experience. Perhaps that can only be a one-way street at any given moment, but either way, the idea is that all forms of physical being can experience change in its own disposition and through this sensitivity can also infer exterior dispositions through comparing their own dispositions. This comparison is projected subjectively as a an invariant disposition, or “position” objectively. I don’t know that anyone has fully understood the radical simplicity of this idea and its implications for tying consciousness together with the cosmos, solving the Hard Problem and Explanatory Gap, but I hope that this picture above helps. I’m not even looking at the angles here of the EPR paradox, I’m just taking the arrows out of the space between the observers and source, and making all three into sub-servers experiencing others through their own local range of the infinity within. My model has some similarities to Relational quantum mechanics (wikipedia.org) and if I stretch it, also to Wheeler–Feynman absorber theory, (because I think that ‘time’ is nested regularities of disposition), but ultimately goes far beyond either one. As far as I know, my model is the only model which suggests a simple and plausible explanation for both matter and experience in the cosmos. *rather than arising magically at some level of physiological description for no real reason. In considering the wave-particle nature of quantum functions and the double slit experiment, I suggest a different interpretation of the pattern and the underlying phenomenon. If we suppose that there are no particles or waves traveling through space at all (bear with me, it gets worse), then the interference pattern becomes a coherence pattern of detection and identification: sense. I call this photon-agnostic proposition ‘quorum mechanics’. I know that it sounds infuriatingly ridiculous to anyone with even a passing familiarity with physics, especially coming from someone who did not arrive at this hypothesis through physics, but consider that light, like color, or heat is in the eye of the beholder. I have a few real world examples that I like to throw around to help unsettle the sense of certainty we have in this fundamental worldview of energy as independent stuff packets, so that a new idea can be considered impartially. If you understand what I’m trying to say, then you will realize (unless I’m missing something obvious – which is certainly possible) that this energy-signal topology would not contradict any experimental data (photoelectric effect, Compton scattering, double slit), just offer another interpretation. 1. Beams of light are invisible in a vacuum, as are electrical sparks. A laser ‘beam’ creates a dot on its target – a beam shaped region is only suggested when particulates in the atmosphere between the source and the target are illuminated. Our only experience of light is in the effects it has on matter and the effects they have, in turn, on the matter that makes up our nervous system. If photons were anything like particles of a substance, a flashlight would likely emit them in a form more like a bolt of lightning, with paths illuminated and branching as they collide with the gazillion other interfering photons. Only by defining photons in the most insubstantial terms can we imagine that they can be described by either term, ‘particle’ or ‘wave’. 2. Microwave ovens cook without heat. No hot air, not hot oven, a microwave propagates a focused condition of electronic enthusiasm which water molecules pick up on and are inspired to jiggle and spin along with, rubbing the other molecules next to them, spreading the enthusiasm tangibly as friction. I think it could be said that it’s a technology which signals food to cook itself. 3. Waves are not necessarily real as independent phenomena. Think of a wave in a crowd. There is no physical collision forcing people out of their seats when the wave hits them. Instead, each individual node synchronizes themselves voluntarily by anticipating and executing an internalized participation of the group motion. Maybe light works the same way – node to node and not independent projections through space. 4. Waves are a context-dependent interpretation. On one level an ocean wave is an experience of bobbing up and down for something floating on it. On another level it’s a ripple propagating out to become a curling, crashing volume of seawater on the shore. What the wave is depends on what your view is. A sphere works the same way. If you are small enough and close enough to the surface, a sphere is a plane. In the same way, the particle and wave nature of light depends not only on our view of it, but what we’re viewing’s view of it. 5. Photon particles don’t accumulate anywhere. 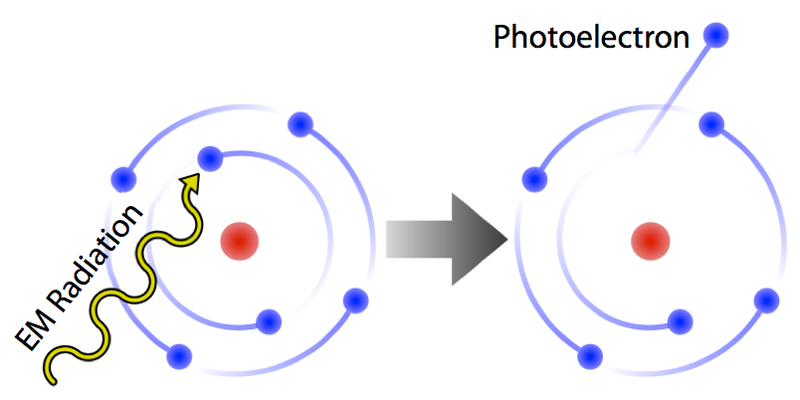 You don’t find any photon precipitates – no glowing crusts of pure light to scrape off of light bulbs. If light came in particles which could be considered in any way independent of their source or target, they would probably wind up in pools or chunks somewhere wouldn’t they? At best a photon could be considered a currency of exchange between atoms, and like currency, my hunch is that the physical form itself is irrelevant and maybe not necessary at all. 6. Electricity works indirectly in this way. We don’t put electrons in one end of a wire and have them come out the other side. It’s the flow of electrons as a whole which is overriding the discrete nature of the conducting atoms. What comes out is matter trying to act like the action that was initiated on the other side of the conductor, in the closest approximation it can. It is more of a pantomime or imitation that simple communication of ‘information’. What this means is that we don’t see microwaves because our eyes lack the ability to detect them, and we don’t feel microwaves because our skin lacks the sensitivity…’we’ don’t see microwaves because for ‘us’, they don’t exist. What we see as visible light does not ‘exist’ either, but rather is an experience of sense, an isomorphic recapitulation shared between the sense-motive experiences of eyeball, retina, optic nerve, cortex, image, and external surfaces, actively illuminating matter, passively illuminating matter, spatial relations, between them, etc. We don’t see light, we see brightness, image, color, visual pattern. None of these things are suggested or predicted by a photon model. Only by understanding how sense scales all the way down the microcosm and up the macrocosm do the double slit experiments make sense. What we are looking at is signal coherence between an illuminated object (like an electrically excited semiconductor or filament) and two targets arranged to interfere with each other. Our own eye or camera is the fourth object in the experiment. Each node is an interpretation site of the event which is in turn interpreted/imitated, (in whatever way it can through the limitations of what it is) by the other nodes. Our eye, brain, and mind is participating in the experiment as much as the equipment we assume we are using to test it. That’s why we get all this observer effect and uncertainty principle strangeness in our results, because we are testing for something which has no external reality. Light is nothing more than a feeling we can see, and when we see the double slit experiment, we are seeing matter represent itself. It’s as much the mask that separates the slit being represented as the ‘light’ we presume is streaming through it. I understand your objections. I don’t want to waste time trying to convince anyone this is possible or plausible, but I would be very interested in hearing if anyone has any concrete evidence that photons must physically exist (and not just that we observe a material tool acting like we think it would when we assume they exist), particularly real world common sense examples. If instead we understand photons as logical sense patterns which shape the way matter detects and interprets itself rather than an inert, invisible, intangible, probabilistically invoked nothingness, then the riddle of consciousness and life in a deterministic universe has a new point of reconciliation. As it stands now, our view of these micro-nothings imply that with no mass or charge they somehow accidentally gives rise to all visible, tangible, somethingness. I think that my conjecture explains why the speed of light travels at c. Think of c not as a velocity, but rather the opposite of stillness. When something is still, it can be defined as being in the same place through a duration of time. When something is c, it is not moving, it’s just in more than one place at the same time. In between stillness and c, you have phenomena progressing across successive places through a duration of time. My view is that phenomena at c are subjective and interior experiences – potentially everywhere, anywhere, and nowhere depending on the limitations, configurations, and interactions of the slower-than-c experience-objects. When objects change, they create an experience of space and time which is vicariously experienced by other objects. There is no objectively real continuum of space, time, or spacetime, it’s all just understanding of other subjects objective relations to each other and to the interior processes thereof. Latency and signal attenuation are two of the devices which energy uses to generate the inference of time and space, which is why light doesn’t seem to travel infinitely fast – it respects the sense of object relations to accurately reflect itself in the contexts and conditions that it creates. What we observe in the double slit experiment is not a wavelike distribution of particles, but a waving of perception itself, qualitatively flattened by design of the experiment to allow only the most public-facing, quantitative expression of the event. I think that this view can help us reconcile quality and quantity, deep private simplicity with flat public complexity, feeling through time with objects across space, and a model of mind and matter as constructive and destructive interference patterns within a neutral monism* of sense. Mind, or subjectivity is sense becoming aware of itself, while matter or objects are that which sense doesn’t identify with personally. Sense is the symmetry of self-similarity and difference which allows both protagonists inside-out orientation of subject and the occidental-materialist view of the universe as a public outside-looking-in view. The constructive augmentation of sense through subjectivity gives rise to private accumulations of deeper and richer subjective qualities through a creation of ‘time’ (significance). The destructive cancellation of sense through objectivity equates to a qualitative flattening through the evanescence, entropy, or loss of significance of objects across space. It may be the case that matter can only be experienced when a subject detects other subjects or parts of subjects from a different inertial frame so that objects are always the back side of what subjects can experience of themselves. We cannot see our own matter-side and all matter sides are what can only be seen from an objective perspective. This means that matter is an epiphenomenon of subjectivity rather than a direct equivalent or reflection of it. Objects are a second order logic, requiring both subjectivity and the underlap of sense between the native inertial frame and the objectively perceived frame. Subjects are lower order logic, requiring only that sense make sense of itself – ie, experience can occur without another inertial frame, as non-representational emotion, awareness, etc. *A neutral monism would be neither mind nor matter but I think that the reality is more of an involuted monism, where mind, matter, and sense are all sense, only each in a different sense. Are you equating “sense” with “consciousness”? Sense is the thread that weaves the tapestry of objective and subjective realism. Sense is everything. Consciousness is a specific category of sense applicable generally to living animals and humans in particular; ie subjective content of feeling, participation, will. Is light energy within a background-foreground relation. As far as you understand, within the framework of your model, was energy (including light energy), created? Light is a subjective visual experience. Energy is an objective way of generalizing the dynamic qualities of all experience by removing or flattening the semantic (proprietary, subjective) qualities and modeling only quantities of changes to material bodies. It is more accurate to say that causality itself is created by sense, with light and energy being types of sense. Light is a direct visual sense experience, energy is an indirect sense (a cognitive experience about what many experiences have ‘in common’). i agree, and I explain why in my next post to jcs-online. O.K. I see that. But qualities are dynamic, and one wonders where all that vitality of dynamics comes from. How is this “removing or flattening” to occur without the vitality to do so. Change is a result of action. How does this “quantities of changes” occur without action? I do note that I had a similar, and 6-7 year long ongoing dispute with Leon Maurer (spinning in his grave any time I even now mention it). You might be interested in taking a quick look at him if you have time (natural or cultural time), hearing his side of the story. You can Google” leon maurer consciousness” or search the jcs-online archives. He also had posted a lot to MindBrain@yahoogroups.com, a forum I no longer particulate in. Yes, I got your email but forgot to get back to you until now. The flattening of qualia into quanta isn’t a cause and effect event, it’s just the symmetry inherent in sense. Any change in the totality is made of the experience of what has been isolated and its experience of what it has been isolated from. The degree to which the subject disidentifies with the rest of the cosmos is the degree to which the subject has a coherent identity. I think I understand what you are saying. I might say something like; it is as if all possible configurations of all possible worlds existed, manifested simultaneously. Then, one tunes into some particular event. maybe something like that? however, I still see Aristotle’s infinite regress here. I wonder about the “isolation” part. Aren’t you just equivocating here? Okay, no dynamic vitality in the various configurations, but now you seem to have just shifted the discussion to isolation of events. Consciousness is acting, acting to isolate events. This simultaneously existing scenario of all possible events has no identity, within itself. Isolation creates identities, distinguishes this from that, doesn’t it? There is no cause-effect relation, but there is a foreground-bakground relation. In order to have that, you are right, the foreground must be isolated from the background. That is, as far as I can tell, the job of what most call our everyday consciousness. Isolation is action. Action is a part of all identities. Well, that’s how I see it right now, but I am open to suggestions. I don’t necessarily think that the Totality is all possibilities, I think it’s more interesting than that. It seems to me that what I call ‘sense’ is like a semantic gravity that curbs infinities – giving us one universe of more and more sensible things rather than more and more universes of anything. I use concepts like ‘significance’ and ”solitropy’ to flesh out the fundamentals of what this is and how it modulates the senselessness of probabilistic eternity with the coherence of each here and now perspective. Isolation is an action, yes, but if that action causes time rather than being an event in time then the isolation is one-way. The isolated experience is a new sub-totality (self) from its own perspective but from the totality’s perspective it is just a temporarily alienated event. Think of it like a crack in drying concrete. When the slab is cracking, there is a tension released between inertia and novelty, a fault which embodies the obstinate/insolent contradiction of identity itself. The crack is something that is generally destined to happen, but the specific pattern is different and unpredictable. This is how time works…the larger agendas are inevitable, the details are up for grabs, and can even overturn the larger patterns. or you could Google “Otmar Pokorny, Leon Maurer” I just thought of that and did it. That was fun! The same way I understand that some rhythmic sounds makes me want to move in certain specific ways. To name it something like vitality I think reifies it into an object, but it is not an object, it is a sense-motive quality. I also sent this to your e-mail address. >I don’t necessarily think that the Totality is all possibilities, I think it’s more interesting than that. Otmar: O.K. I have no problem with that. > It seems to me that what I call ‘sense’ is like a semantic gravity that curbs infinities – giving us one universe of more and more sensible things rather than more and more universes of anything. Otmar: Materializing in any form whatsoever, such as your one more universe, at once multiplies the possibilities of further materialization. Clearly you only increase infinities, you don’t curb them. >I use concepts like ‘significance’ and ”solitropy’ to flesh out the fundamentals of what this is and how it modulates the senselessness of probabilistic eternity with the coherence of each here and now perspective. Otmar: I agree, significance (I am not familiar with the term “solitropy) fleshes possibilities out. The structure of probabilities deals with parallel experience on all levels. You consciousness picks and chooses to accept as real the results of what is significant to you. You focus these through a time structure. Your focus allows other just-as-legitinate experience to become invisible or unfelt, UN-SENSED as you might say. In the same way that you latch upon one personal biological history, you latch upon but one earth history. Others go on about you all the time , and other probable selves of your own experience their “histories” parallel to yours. In practical terms of SENSE DATA, these worlds do not meet. Otmar: Hold everything!! Are you going to go on and say there can be action, or consciousness, without energy? >but if that action causes time rather than being an event in time then the isolation is one-way. Otmar: Consiousness is NEVER one-way, is it? Consciousness is ALWAYS relational. Either a relation with itself, or between self and what is apparently an isolated identity. >The isolated experience is a new sub-totality (self) from its own perspective but from the totality’s perspective it is just a temporarily alienated event. Here, I think, is a difficulty in understanding subjectivity and objectivity. You say that action causes time. However, action must first create identity. Without identity, action would be meaningless, for there would be nothing upon which action could act. For example, there could be no time. An identity may be termed action which is conscious of itself. Do you agree? Of course, as with any word, there are likely other ways to understand identity. But, do you agree we can think of an identity this way? For the purposes of our discussion, the terms “action” and “identity” must be separated, but basically no such separation exists. An identity can also be interpreted as a dimension of existence, action within action, an unfolding of action upon itself -and through this interweaving of action with itself, through this re-action, an identity is formed. For example, if concrete dries and a crack appears, you create the identity, the crack. However, in creating the first identity it was necessary for the ALL or EVERYTHING to act on itself. The energy of action, the workings of action within and upon itself, forms identity. Yet though identity is formed from action, action and identity cannot be separated. Action is therefore a part of all structure. Action, having of itself and because of its nature formed identity, now also because of its nature would seem to destroy identity, since action must involve change, and any change seems to threaten identity. It is a mistaken notion, however, that identity is dependent on stability. Identity, because of its characteristic will continually seek stability, while stability is impossible. It is this dilemma, between identity’s constant attempts to maintain stability, and action’s inherent drive for change, that results in an imbalance. That imbalance is consciousness of self. So, you see, consciousness of self can never be separated from action. You said, “Isolation is an action”. Action isolates, creates identity, s I suggest above. When you say, isolation is an action that cause time, this is a different kind of action. Consciousness of self is still consciousness directly connected with the action described above. The action you describe is ego consciousness, a state which happens when consciousness of self attempts to separate itself from action. Creating time is an example. That separation is obviously impossible, since no consciousness or identity can exist without action. Consciousness of self involves a consciousness of self within -and as a part of -action. Ego consciousness, which is what you sam to be talking about, involves a state in which consciousness of self attempts to divorce itself from action -an attempt on the part of consciousness to perceive action as an object…and to perceive (sense?) action as initiated by the ego, rather than as a cause of ego’s own existence. > Think of it like a crack in drying concrete. Otmar: You see, you are already starting out with a pre-existent identity, a crack. And of course there is the cement, and the observer. Gotta hop. She who must be obeyed is requiring me to do a chore. Later….. When the slab is cracking, there is a tension released between inertia and novelty, a fault which embodies the obstinate/insolent contradiction of identity itself. The crack is something that is generally destined to happen, but the specific pattern is different and unpredictable. This is how time works…the larger agendas are inevitable, the details are up for grabs, and can even overturn the larger patterns. Multiplications of possibilities don’t increase infinities compared with multiplications of inevitabilities that you have without sense. Without sense, everything that can happen must happen somewhere. With sense, the only things that can happen are those which are consistent with what has happened already and what those things needs/wants to be resolved. Eh, I think MWI kinds of theories are a cop out. I understand the theoretical appeal, but in practice, there is only one universe, one history of Earth, one personal biological history, etc. Parts of all of them can be augmented, reflected, masked, distorted, etc into other stories and stories of stories, but I think that they all take place in this universe and nowhere else. I see energy as a word to describe how materials change each other. If matter is really only the inertial build up of time-deferred sense presentations, then energy is nothing but the ‘show’ in which consciousness participates. There is no energy independent of consciousness. Energy is the story of what is happening now and how it relates to what has happened and what can happen. I’m saying that if time only exists as a result of an action, then the events that are set into motion are not truly isolated, it only seems that way from within those events. The more primitive consciousness has a relation with the secondary consciousness, but the secondary consciousness only feels that it is isolated, even though that isolation can only be a symptom of a deeper expectation of unity. Without time, there is no ‘first’. There is no scheduling of creation. It’s like programming a game and then running it. The programming of the game does not take place in the elapsed runtime of the game. In this case, we are dealing with the ultimate program, so it is unconstrained by any of the conditions which we are familiar with from our view inside the game. Identity is not created by action through time, identity is the relation of the action to the inertial frame being opposed by the action. If I hit the gas pedal, the identity of the highway changes in the exact proportion to my acceleration. The highway exists to travel on, and traveling is only possible on the highway, so they are aspects of an irreducible whole. An identity may be termed action which is conscious of itself. Do you agree? I don’t know if an action can be conscious of itself directly, I think it can only triangulate what it might be by what sense it can make of how its actions change experience. Of course, as with any word, there are likely other ways to understand identity. But, do you agree we can think of an identity this way? For the purposes of our discussion, the terms “action” and “identity” must be separated, but basically no such separation exists. An identity can also be interpreted as a dimension of existence, action within action, an unfolding of action upon itself -and through this interweaving of action with itself, through this re-action, an identity is formed. For action I use motive, and for identity I use sense. Action would seem to imply a physical change in a public arena, whereas a motive can insist within our experience as a concrete reality, whether it results in a public action or not. Action is a contagious spread or alignment of motives on different levels (molecules, cells, bodies, etc. all have different motives but an action must be accomplished by addressing multiple agendas at once). Identities do not form, they are forms, and they inform our experience. They have no components, they are only the experience of making sense – bridging a gap between subject and object. Components are an afterthought. An identity can be deconstructed or reconstructed, but it cannot be assembled or formed, only revealed. It’s always necessary for the ALL of EVERYTHING to act on itself. The crack is not a created identity, it is an event that is revealed and identitfied. It isn’t a simulation that we attach identity to, identity is the basis upon which all ideas of simulation are based. Right. Sense and motive are like electromagnetism. They are one thing which is involuted into two modes.. Identity doesn’t need to do anything to maintain stability. It is inertia itself. It is action which reveals the inertia by changing the relation which defines apartness from the whole frame. Pure consciousness is always separate from action, it is the continuity, the relative invariance of solitude through which actions are defined by their contrast. Action changes identity but every action is predicated on something which has not been changed by the action, so that memory and continuity can keep track of the change. Consciousness is stillness, which can exist (really insist) without action. Human consciousness is famously expanded through meditative stillness, and the reputation that psychedelics have for expanding consciousness would have to correlate with the recently discovered effects that they have on the brain, to inhibit and quiet normally busy central regions of the brain. I’m not really looking at ego or human consciousness in particular, I am trying to get at the elements of universal subjectivity. What should I start out with? Yes! Taking it further. The totality would not be “one with everything” but radically seperate from it, as all sense would be experienced as the experience of the “world;” it would know that it was nothing and be able to make total sense of the idea. As such it would have the deepest, albeit incomprehensible, sense of personal identity. I generally agree. It seems to me that the absolute could be compared to a spindle or hub which is unchanging except for accumulating significance by relation to the change it is expressing as the spacetime universe. Like a perfectly preserved antique, it is forever its own most ancient and indispensable artifact. I don’t know if that would be like a personal identity. The God concept marries the Absolute to a human personality, but I don’t see any particular reason to assume that…although the archetypes of a personal God could certainly stand between our ordinary awareness and the Absolute. I’m not even sure that there is anything that ‘is’ the Absolute, it could be visible only from a distance – as a beacon of solace, solitude, wholeness, healing, help. Those qualities may not be possible to manifest however without the dialectic of separation from them. Can you appreciate solitude in perpetual solitude? It’s hard to guess, for example, whether a hummingbird’s idea of the Absolute would have the same restful quality that humans have. Do all organisms long to ‘rest in peace’ on some level? Gravity arguably suggests that matter itself seeks its own annihilation, and that it seems peaceful enough. I agree with the radical separation, in the sense of the Absolute playing the role of the Catcher in the Rye. A kind inner+outer bound of sense whose perpetually deferred satisfaction is echoed to some extent on every level but never completely. That deferment is the engine of spacetime aka the Big Diffraction. What looks like a Big Bang from inside of spacetime, feels like holding your breath forever on the outside. Maybe that’s part of what keeps coming up in religion as the theme of sacrifice. Craig, I think you are truly brilliant. I have to try to absorb this. I recently got into the concept of the universe being virtual reality. It made sense … until I came across your work. Now I am even more confused. When I have grasped your perspective ( at least 1 % of it! ), I would love to ask you some more questions if I may. Sure please come back anytime with questions. The virtual reality model of the universe is a great place to start. I would not have been able to get from a conventional Newtonian worldview to the view that I have now without spending a lot of time in virtual universe first. It does make sense, except when you try to justify why there is any presentation in the first place. A computer can model music without playing it, or edit images without projecting them up on a screen, so why would there be a universe of sights and sounds pretending to be reality when it already has a reality of the actual data to use instead? Thanks for your reply. I am slowly going through all your articles to get a sense (!) of where you are coming from. I will be offline for most of the next 4 weeks, but I am sure I will have a few questions when I come back. Your work calls to mind a famous quote by Goethe ” Wär nicht das Auge sonnenhaft, Die Sonne könnt es nie erblicken.” that is: “Were the eye not sun-like, it could never see the sun’s light.” Goethe goes on to say ” Läg nicht in uns des Gottes eigne Kraft, Wie könnt uns Göttliches entzücken.” thatt is ” If God’s own power didn’t rest in us, how could we delight in the divine?” As you probably know, Goethe did experiments with light and had a different theory about it to Newton. Space and time are, perhaps mere secondary, and flawed, abstract constructs from the observation of motion. A manner of describing what we observe. They are locally useful constructs, to be sure, but if we really want to try to make sense of everything, all at once, I think that we have to see space and time as measures of our own insensitivity – as cryptic as that sounds. Not just our own insensitivity as human beings of course, but as countless states of being and bodies within bodies on multiple levels of scale.